Former psychiatrist Kuro Tanino will work on the Osaka version of “Darkmaster” during his residence stay. “Darkmaster” is a theatrical performance written and directed by him and was released in Tokyo in 2003 and 2006. 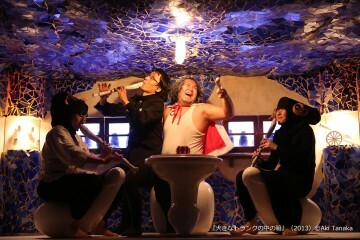 This performance takes place at a small Western restaurant in Osaka called “Kitchen Nagashima”, which is run by a master who has top-class cooking skills. One day, the master proposes to a young man who came from Tokyo to replace the master’s position but..., The story evolves from the small restaurant in Osaka to Tokyo, Tokyo to Japan, and Japan to the world and the multiple relations amongst those places are gradually revealed. The instructions by the master can be heard directly through provided earphones and the smell of dishes prepared at the stage during the performance will stimulate your senses. 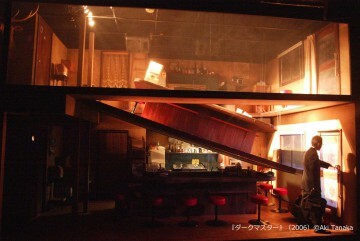 Open rehearsals on the actual stage sets are scheduled during Tanino’s stay in KIAC. If you want to use the day-care service, please call Kinosaki International Arts Center before Fri, Apr. 15 to make the reservation.